Note: Unless you clearly understand how to add, delete, or modify HTML attributes and their associated values, it's best not to do so. 1. From the View menu (or the Edit Mode toolbar), choose Show All Tags. 2. Double-click the object that you want to modify to open its Properties dialog box. * HTML Attributes: Click this tab to view or enter additional HTML attributes. * Inline Style: Click this tab to view or enter additional CSS (cascading style sheet) properties through the style attribute. 4. To edit a property or attribute in any of the three lists, select the attribute you want to edit. You can then edit the attribute's name or value using the editable Attribute and Value fields at the bottom of the dialog box. To add a new attribute, type it in the Attribute field at the bottom of the dialog box. The new attribute is automatically added when you click in the Value field. To remove an attribute, select it in the list, and click Remove Attribute. Note: Required attributes are highlighted in the Attribute list. 5. Click OK to apply your changes to the Advanced Property Editor dialog box. 6. Click OK again to exit the Properties dialog box. 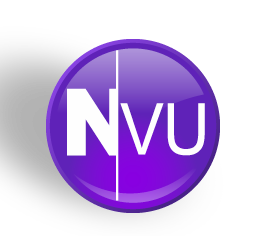 Nvu automatically places quotation marks around any attribute text.